Once upon a time we would have never considered ourselves “cruisers.” We didn’t like the notion of following someone else’s itinerary. We were wary about being stuck on a boat in the middle of wide-open seas. Yet slowly but surely, our minds are changing. Every time we try a cruise, albeit seldom, we warm up to the idea. We’re starting to see cruise ships as a glorified means of transportation. You get to see the distance from point A to point B unfolding just outside your room’s window — and that’s hard to beat. Plus, cruises are perfect for those hard-to-reach destinations, like Alaska. I had always heard stories about cruising through Alaska, and now I understand why the two go hand-in-hand. For starters, Alaska has some tiny towns. While they’re absolutely worth seeing, they can be thoroughly explored in a few hours. An Alaskan cruise makes it really easy to check out all of the small, photogenic places you might skip if you were planning the trip yourself. But the best part about an Alaskan cruise is without a doubt: the breathtaking scenery. Massive, arctic blue glaciers, misty covered fjords, and bald eagles perched in trees 20 feet away from us — Alaska defines breathtaking scenery. The entire cruise was teeming with captivating vistas. Even our days-at-sea promised panoramic views spotted by waterfalls, crisp mountain ridges, and floating icebergs. Plus, the only way to see Glacier Bay is by boat, and seeing Glacier Bay is an absolute must during your Alaskan adventure. So from highlights to scenery to cozy hospitality, a cruise has you covered. Once you’re ready to embark on your Alaskan adventure, make sure you spend time picking the right cruise line and route. If you wind up choosing an itinerary that only has a few places you’re interested in, boredom will ruin the experience for you! For our cruise, we were interested in exploring the glaciers, observing wildlife, and gawking at the infamous Alaskan scenery we’d heard all about. We chose Crystal Cruises Majestic Alaska trip because all of the ports on the itinerary fit us like a glove. Crystal Cruises is a high-end luxury cruise line, so we were safe to expect comfy accommodations, delicious food sans buffet lines, and expansive excursion options. With the exception of excursions, our cruise was all-inclusive. We had access to unlimited alcohol, wine, and beer, and the selection was enough to keep us happy. And nice and toasty ☺ Alfredo, our butler for our room, even made sure to stock our room with our favorite snacks and drinks. Paradise! With Crystal Cruises, we booked a 10-day cruise starting in Vancouver and ending in Anchorage via the Inside Passage. For our Alaskan journey, we didn’t want a party boat with Tiki decorations and 80’s night. We wanted a sophisticated space we could melt into. We wanted to absorb the scenery in a peaceful ambiance. Crystal Cruises was an amazing match for our expectations. Make sure you do the research to find a cruise that fits your personality and intentions! Our Majestic Alaska adventure began as we boarded the Crystal Serenity — a pretty big ship with the capacity to hold 1000 people. Although the ship is huge and was nearly full, it never felt crowded or stuffy. The Crystal Serenity is an award-winning, world-class luxury cruise that had been renovated beautifully before our trip. It was easy to understand the ship’s prestige, to say the least. The Crystal Serenity is outfitted with tons of relaxing common areas and creative amenities. It has two pools, one covered in the event of bad weather and one below the sunshine, surrounded by cozy lounge chairs and umbrellas. If you’re looking for something to do, you can head to the putting green, take a fitness class, hop in a dance lesson, join a trivia competition, or lay back in the theatre for a flick or two. There’re also a variety of chic boutiques on board, if you feel like donning a new outfit for dinner! My favorite part about The Crystal Serenity was the common spaces sprinkled throughout the ship. I loved the Crystal Cove, a public space located in the atrium at the bow of the ship. With floor to ceiling windows, it was the perfect nook for eyeing the landscape and sipping tea or cocktails. The sound of live music suspended in the air while passengers chatted contentedly. It was totally our happy place! The amenities aboard The Crystal Serenity felt endless, but I love that many of them valued the importance of health and wellness. In addition to a state-of-the-art gym offering professional fitness classes and upscale equipment, there was a gorgeous spa on board. The spa offers some of the best views on the boat… Add a massage to that equation and I don’t think it gets better! In light of the recent renovation, the design of our cruise ship was immaculate and trendy. The atmosphere aboard The Crystal Serenity is first and foremost refined. Everything is freshly new, encapsulating elegant style with modern touches. And while the design definitely feels nautical, it accomplishes this seaward style in a unique and colorful way. A lot of the common spaces for example, especially the outdoor ones, feel inspired by West Coast flair — with pops of bright color and intricate pattern play. Book a Room With a Balcony! The posh yet comfy accommodations on The Crystal Serenity are a definite highlight. We stayed in a Penthouse Suite with Verandah, and absolutely adored it! Although Alfredo, our attendant, was easily the best part of our room. He took phenomenal care of us, even stopping by our room everyday at 4:00pm to deliver our favorite snacks. During one sea-day I got a little sea sick, and Alfredo was quick to get me ginger pills, medicine, and a fully loaded fridge of ginger ale and sparkling water. His warmth really made our stay feel so much more like home! The suite itself was pretty large and decorated with glamorous prints and rich textiles. It had has all of the expected amenities, plus Etro toiletries and Frette sheets — heavenly! Here’s a tip you don’t want to miss: if you’re cruising Alaska with Crystal Cruises, make sure you get a room with a balcony! On the days we cruised through Glacier Bay and Hubbard Glacier, we snapped stunning pictures without having to fight the crowds at the bow of the ship. Plus, you can arrange for cocktails or breakfast on your balcony while you sail through the arctic backdrop. Other than the Dining Room, you have plenty of opportunities to satisfy your hunger. The Lido Café is an extravagant buffet option that offers exotic variety from around the world. In the same area is the Trident Grill, a laid back restaurant with fabulous ambiance. You also have Tastes, another more casual, Mediterranean tapas-style option, or The Bistro, a Euro-style café with a chocolate fountain at night. Speaking of sweets — the ship also has a Ben & Jerry’s bar to cure your cravings any time! The cruise ship does offer upscale options if you’re looking for a special night away from the Dining Room. There is a Nobu and Prego on board, which you can dine at once during your stay. However, you can order room service from either restaurant whenever you want! As you see — the dining options on The Crystal Serenity are abundant. For our 10-day cruise, we had more than enough options to feel excited before each meal! Ben & Jerrys anytime you want it! Trust me, I know that the sound of cruise ship entertainment sounds a little cheesy. I always imagined blingy, Vegas style productions with enough pizzazz to scare me off the boat. But Crystal Cruises manages their productions differently. They curate their selection with class and care to create an engaging lineup of guests. We checked out Donovan and Rebecca, a pair of talented acrobats. It was better than most of the Cirque du Soleil shows I’ve seen! Other nights we would cozy up with a Negroni in a snug leather chair inside the Avenue Saloon watching Perry Grand, a very theatrical entertainer! No matter what character you are, you’re bound to find an outlet of entertainment onboard. 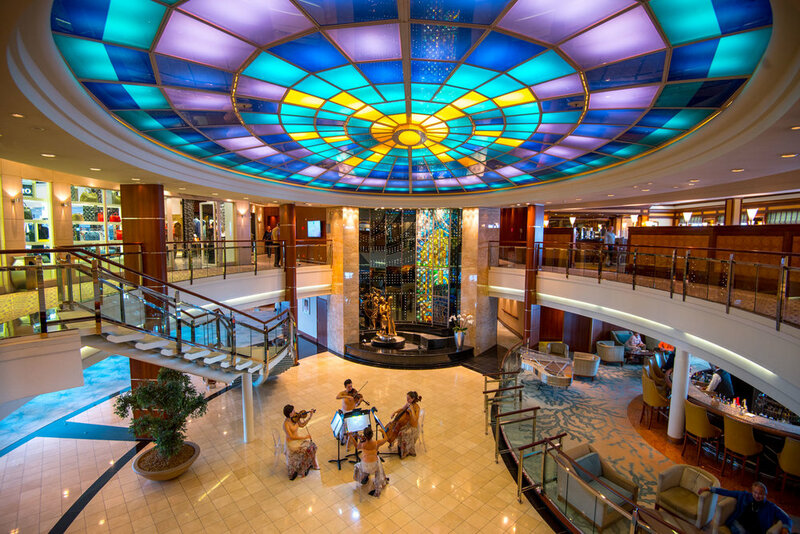 Crystal Cruises even offers a variety of art classes, lectures, and guest speakers. There was always some kind of event that you could sign up for. But we were always so drained after the excursions that we always kept it low key around the boat. Looking back at our Majestic Alaska trip up to this point, I realize how incredible it was, and for so many reasons! But what truly made this adventure amazing were the excursions. In entirety, the trip was 10 days of sailing around Alaska through the Inside Passage. Three of the days were sailing days (two of which were cruising by towering glaciers). The rest of the days were spent at small ports dotting the Alaskan coast, embarking on various excursions provided by Crystal Cruises. We had the option to go on helicopter tours, go bear watching, embark on ATV adventures, or simply wander around the towns at our leisure. All of the tours must be booked in advance at an additional cost, so don’t wait until the last minute to decide on the excursions. You’ll seriously regret it! 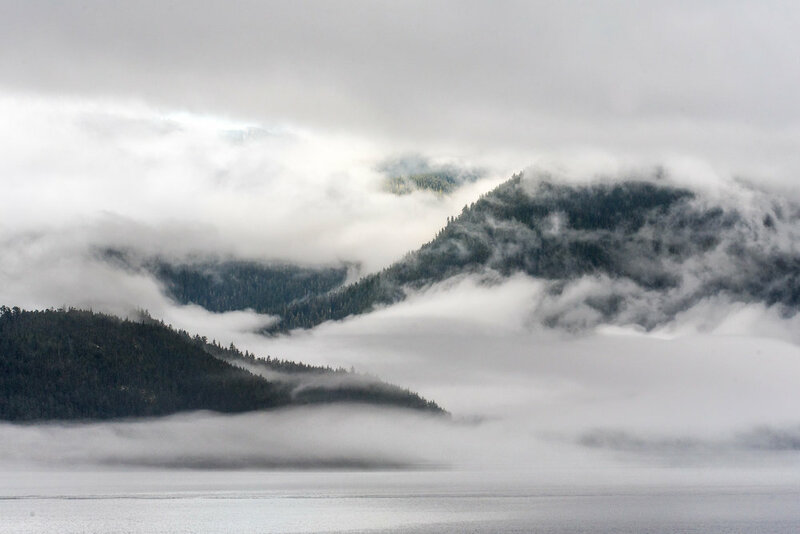 Take a seaplane over the Misty Fjords National Monument. You’ll find yourself in awe over the 2.2 million acres of Alaskan wilderness. Head to Chichagof Island, home to the highest bear population on Earth. The island offers pristine, untouched nature, where you can get in touch with your wild side! Fly by helicopter over the gargantuan Mendenhall Glacier, plus a landing. Once you land, enjoy a guided nature tour around this cool terrain full of photo-taking opportunities. Ever been on a real wheeled dog sled before? Now’s your chance. Meet the professional husky team at Musher’s Camp and take a ride though the backcountry. You’ll get that dose of fresh air you were looking for. Cruise the Tongas National Forest on an ATV, following a guide who will point out the regions most native wildlife. Including the whales, seals, sea otters, and sea birds of the Sitka Sound. We checked into our suite late, so we stayed on the ship to explore and dine onboard. Guests were given the chance to go out and explore Vancouver, Canada’s third largest city. Situated between the ocean and mountains, this hip, coastal city has the world to offer. On day 2, we stayed at port in Vancouver, which allowed us the chance to set out and get some last minute shopping done in the city. We had arrived in Vancouver a week before the cruise’s departure, so we had already thoroughly experienced this Canadian hot spot! Take it from me: don’t forget to take your seasick medication! I spent the start of Day 3 seasick. Once I was feeling better, we walked around the ship and spent time by the pool. The Inside Passage is a 1,000-mile stretch of water lined with massive mountains full of wildlife. Alaska has some pretty amazing sunsets! Ketchikan is Alaska’s fourth largest city. Can you believe it’s only four blocks wide, stretching over 32 miles? This salmon capital is a little rough-around-the-edges, but with plenty of character to offer. You won’t have to venture far to see the iconic fish swimming upstream to spawn. While we were in Ketchikan, we enjoyed the seaplane over the Misty Fjords National Monument excursion. It ended up being one of my favorite parts of the trip! Flying through the Alaskan mountains, surrounded by impeccable and flourishing nature, was an incredible opportunity I’ll never forget! We saw so many waterfalls and nature so beautiful it felt staged — I might have gotten a little teary-eyed. Hoonah was given its name by the Tlingit indigenous people, meaning, “where the north wind doesn’t blow.” And to me, Hoonah pays tribute to all that is Alaska: indigenous people, a history carved by outsiders, freely roaming bald eagles, and bears fishing knee-high in rushing streams. While in Hoonah, we went on a bear-searching tour and spotted two! It was gorgeous and such a blast. Alaska’s capital city is only accessible by air or sea. While in Juneau, we took a helicopter tour that landed on Mendenhall Glacier. Flying above the glacier was full of breathtaking scenery and nature. But to be honest, the landing was a little lackluster. We weren’t able to roam freely, and instead had to stay in a little circle while the guides tried to entertain us. We arrived in Skagway, a city’s whose growth was driven by the gold rush, ready for another excursion. We spent the day driving to a real Musher’s camp, where we learned all about the sport of mushing. There were plenty of dogs and puppies involved! The best part was driving through the mountains and getting a glimpse at more Alaskan countryside. It’s a fun surprise when one of the days at sea becomes a highlight of the trip! Glacier Bay is the largest UNESCO biosphere in the world and is only accessible by boat. We spent the day cruising the bay, observing the glaciers retreating and icebergs floating by. We had to run all around the ship to try and get the best view! When we arrived in this infamously picturesque city, we took an ATV tour in the pouring rain! We got to check out the area’s wildlife and landscape while feeling the Alaskan wind (and rain) in our hair! Imagine cruising by a 300-foot wall of aqua-blue ice emerging from the ocean — sailing before massive glaciers isn’t the kind of thing that gets old! Once we arrived in Anchorage, we disembarked feeling fully satisfied and nourished by our heavy exposure to Alaska’s raw nature. We got off the ship and made our way to Alyeska, a luxurious Alaskan resort, to reacquaint ourselves with land! The Majestic Alaska trip with Crystal Cruises is not only unlike any other cruise we’ve taken. It was unlike any other adventure, period! When you combine Crystal Cruises’ luxurious style with the mind-blowing Alaskan wilderness, it’s impossible not to have the trip of a lifetime. If you’re the kind of person who cherishes invaluable scenery and pure, fresh air — Alaska is your kind of place. And take it from us, cruising Alaska is the way to go!